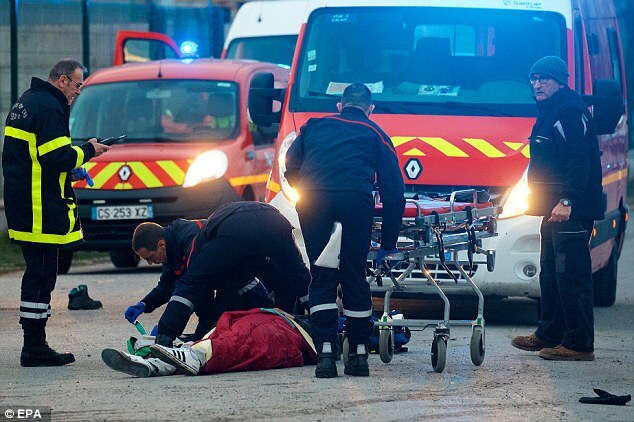 Five migrants were shot during a brawl involving people smugglers in Calais, in what the French government called an ‘unbearable’ escalation of violence in the port that serves as a gateway to Britain. Armed people smugglers were being hunted on Friday after causing a bloodbath that put 22 UK-bound migrants in hospital, five with gunshot wounds. Four Eritreans, who were shot in the neck, chest, abdomen and spine, were in critical condition in intensive care, authorities said. Surgeons fought to save their lives following a series of fights between mainly Afghans and Eritreans who want to claim asylum in Britain. Despite this, not a single arrest was made in connection with the trouble, with those responsible still at large. Police were searching for a 37-year-old Afghan suspected of the shooting. Shots were fired during the first fight Thursday between about 100 Eritreans and some 30 Afghans queueing for free meals at a distribution point near the town’s hospital at around 3.30pm local time. The authorities suspect that traffickers mixed in with the crowd. Shortly afterwards, a second fight broke out at an industrial site around five kilometres (three miles) away, with more than a hundred African migrants armed with iron rods and sticks setting on a group of around 20 Afghans, prosecutors said. Police intervened to protect the Afghans, the authorities said. Clashes between migrants are a frequent occurrence in Calais, where newcomers live scattered in the woods, emerging at night to try waylay passing trucks. The violence comes two weeks after President Emmanuel Macron visited Calais with a message of zero tolerance on migrants setting up camps like the sprawling ‘Jungle’ which was razed in 2016. He later travelled to Britain, where Prime Minister Theresa May agreed to pay more to help stop migrants trying to reach England’s shores and to take in more unaccompanied minors. France’s Interior Minister Gerard Collomb visited the scene of the violence near a food distribution point, saying it was the worst in the port town for years. ‘We have reached an escalation of violence that has become unbearable for people from Calais and migrants,’ said Mr Collomb. Speaking outside the main Calais police station late on Thursday night, he added: ‘This is a level of violence that hasn’t been seen before. 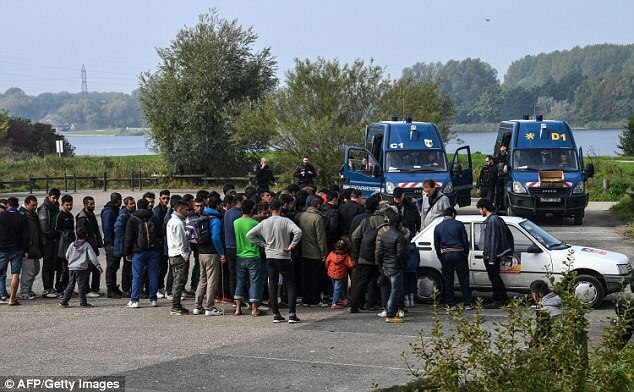 Collomb, who met with security force members and immigration officials in Calais, on Thursday accused the traffickers who charge the migrants hefty sums to secure passage to England, of ‘fuelling daily violence and brawls’. ‘This is a level of violence never seen before,’ he said. He repeated that the government would not allow migrants settle in the area. ‘The message I want to get across is that if you want to go to Britain, it’s not here you should come,’ he said, adding that minors applying for asylum in Britain would be automatically moved to shelters around the country. 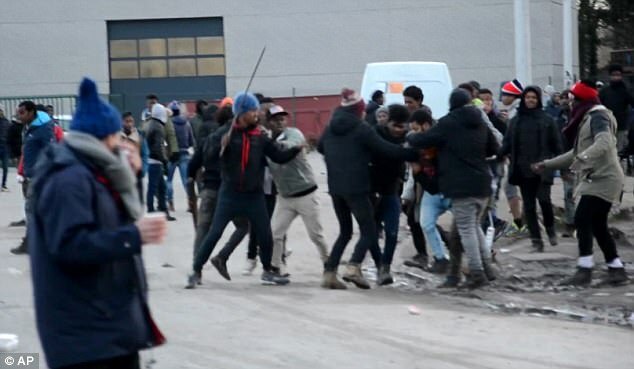 The first brawl on Thursday started at around 3.30pm close to the Central Hospital in Calais, when around 100 Eritreans and 30 Afghans started fighting while standing in a charity food queue. An armed Afghan people smuggler is said to have used a shotgun against four teenage Eritreans who were later rushed to hospital by the emergency services. At around 4pm, a second brawl took place in an industrial estate around three miles away, in the suburb of Marck. ‘A hundred African migrants armed with sticks wanted to attack about twenty Afghans,’ said a source from the local prosecutors office. Then police intervened to protect another small group of Afghans who were being attacked by around 200 Eritreans. As the situation deteriorated around the town, a fifth Eritrean was shot by a suspected people smuggler. The mass brawl, which lasted more than two hours, was by far the worst of a number of violent incidents in recent weeks. At least three of the migrants whose lives was in danger were rushed to an emergency ward in Lille for immediate surgery. The rest of those with gunshot wounds, and others with injuries caused by clubs and knifes were taken to the central hospital in Calais. The riot, which involved hundreds, started among a long line of migrants who had been queuing for food near the hospital, on Boulevard des Justes. It was not immediately clear who had done the shooting, although people smugglers occasionally carry pistols, as do some of the migrants themselves. Hundreds armed with rocks, wooden clubs and other improvised weapons were involved in the rioting, which went on until shortly before 6pm. Many of the migrants complained about CRS riot control officers pulling down tents and bivouacs set up in woods close to the ferry port. Many of them were heard chanting obscenities at the police, as some were taken into custody. Then a second brawl also erupted in an industrial area around two miles away, in the suburb of Marck. Further violence broke out in the late afternoon at a third site. Knives and metal bars were also used in the attacks, which Mr Collomb said was similar to the kind seen at the time of the notorious ‘Jungle’ refugee camp. The notorious Jungle, once home to some 10,000 people, was demolished in 2016, with some 8000 men, women and children relocated to other parts of France – but hundreds more migrants have since descended on the city. 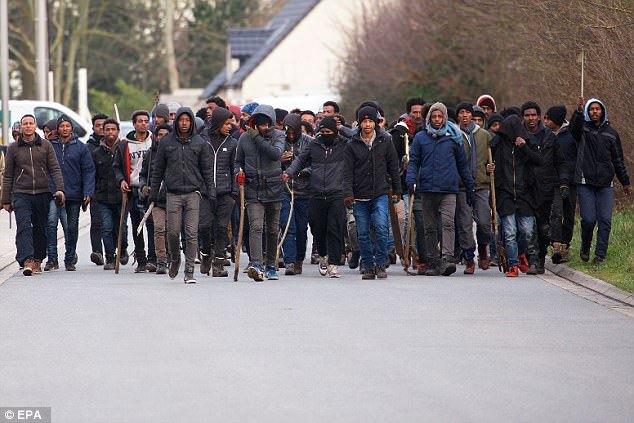 Calais officially became a migrant-free zone afterwards, but now around 1000 have returned. Gangs now frequently fight over smuggling routes to Britain, and over sites where they can pitch their tents while waiting to get to the UK. 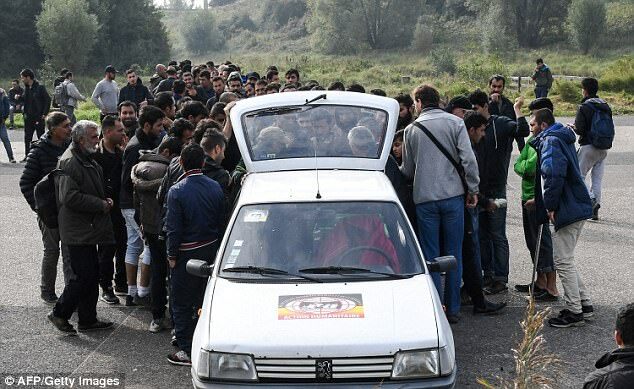 People smugglers make huge profits guiding mainly young men into Britain, via ferries or the Channel Tunnel. 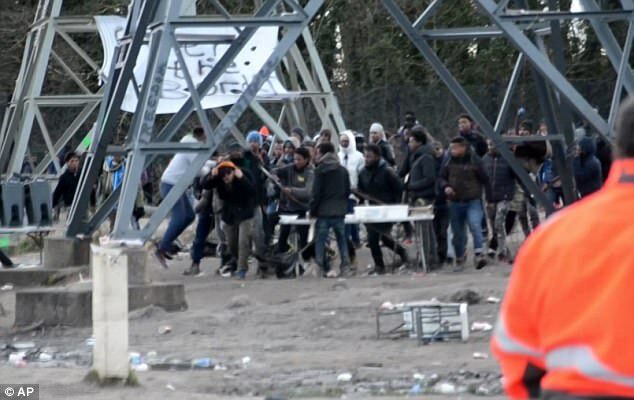 A spokesman for the prefecture which covers Calais said: ‘Police intervened to protect the Afghan migrants faced with 150 to 200 Eritrean migrants. By 9pm, police said that a total of 13 migrants were seriously wounded, as other victims were found by police around the town. Calais mayor said Natacha Bouchart reacted with fury to the incidents, saying such violence ‘was absolutely unacceptable’. Ms Bouchart said: ‘The serious incidents multiplied from this afternoon. This was fighting between migrants, these were turf wars. ‘They are more and more guns, iron bars and other weapons being used. 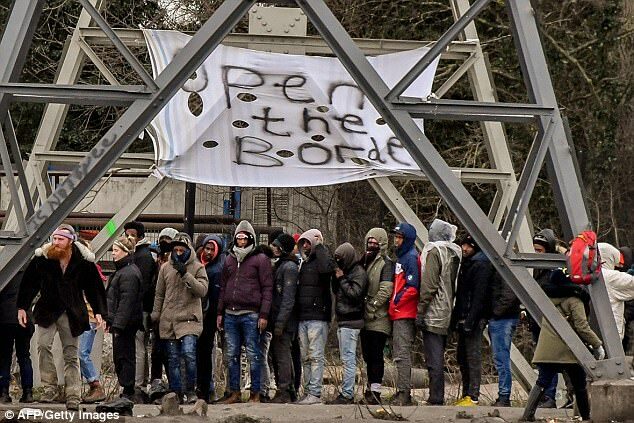 Last month, French President Emmanuel Macron said there would be zero tolerance towards those trying to use Calais as a ‘secret gateway’ to Brtitain. He secured a new border deal with Prime Minister Theresa May, meaning Britain will have to pay more towards security in northern France, and take in more migrants through official channels. During a keynote speech in the port town, Mr Macron said police and other agencies would stop them boarding trains, lorries and ferries heading for the UK. But Mr Macron said it would come at a price to the British, who would be expected to pay more for security in Calais, and to accept greater numbers of migrants who cross the Channel to claim asylum. ‘Everything is done so that illegal passage to the United Kingdom is not possible,’ said Mr Macron. ‘Calais must not be a secret gateway to England. ‘The fundamental challenge is to ensure the security of the port of Calais and the Channel Tunnel’. Mr Macron’s confident prediction followed more than two decades during which the town has acted as a magnet to refugees and economic migrants from all over the world. Beyond pouring millions into more police and extra security measures in Calais, Mr Macron said he wanted to reduce the amount of time migrants spent in France. ‘We need to reduce the asylum application period from eighteen months on average today to six months, as do our European neighbours,’ he said. There are currently up to a 1,000 migrants congregating illegally in the Calais area, according to charity groups and other observers. Many have complained about police brutality – something that the authorities deny is a serious problem.